Almost three weeks have passed since Anthony Sullivan and I launched The Submissions Grinder, a web-based tool for writers to find markets, track submissions, and look at market response statistics. At the time of launch the site was very simple, with a limited set of features, and admittedly some stability issues. Just because we are the only free option does not mean that we have been resting on our laurels. We have been working hard on the site. The site stability issues of those early days have been resolved. New features, enhancements of existing features, and bug fixes have been added steadily. We now have more than 900 approved market listings, and counting. We have hundreds of registered users who have logged almost 8000 submissions into the system. We would like to extend a heartfelt thanks to everyone who has registered, logged submissions, spread the word about our site, reported bugs, suggested market listings, suggested features, volunteered to keep market listings up to date, donated money to us, or shared feedback. We are glad to know that our effort has not been in vain, and that our tool is serving as a resource for writers like us. Now that the Grinder has been around for a while we just wanted to share some of our favorite features that are now in place, and some features that are in the works. The Submissions Grinder is worlds better than it was at its launch on January 7, but we’re not done yet. These are just a few of our current and future features in the works. Please feel free to leave comments here or elsewhere about what features are important to you, what you think of our current and planned features, or anything else that you’d like to say. These are the core functionalities that make the site a worthwhile tool. The Grinder keeps a list of your fiction pieces, and you can make entries for each submission of each story, keep track of which ones are pending. 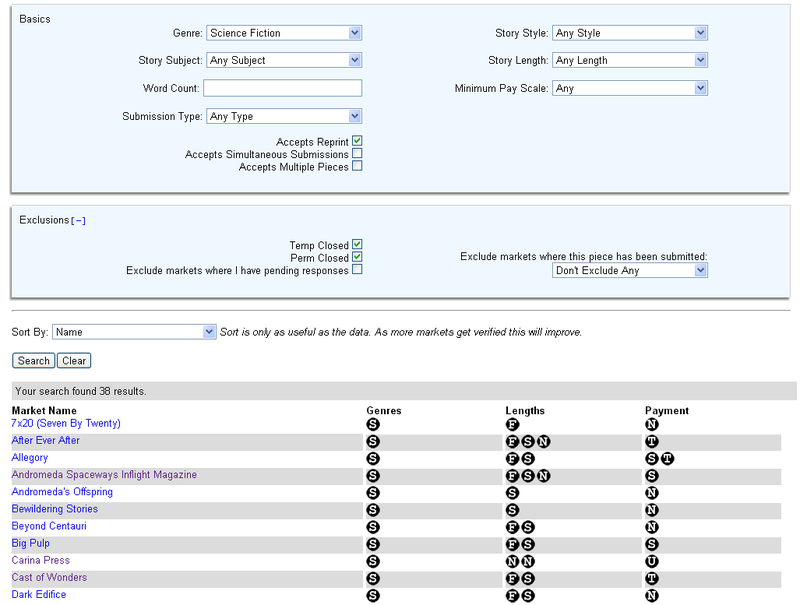 You can quickly filter your results down to show just the set you are interested in, such as all the submissions made to a particular market, or all the submissions of a particular story. You can search for new markets for your work, based on various parameters, including length, genre, pay rates, and many other factors that are important to us writers. If you’re a new writer, this kind of tool is essential to finding places to send your work. If you’re a veteran writer, you might still find something new from time to time. This is really the most valuable thing that this system provides. 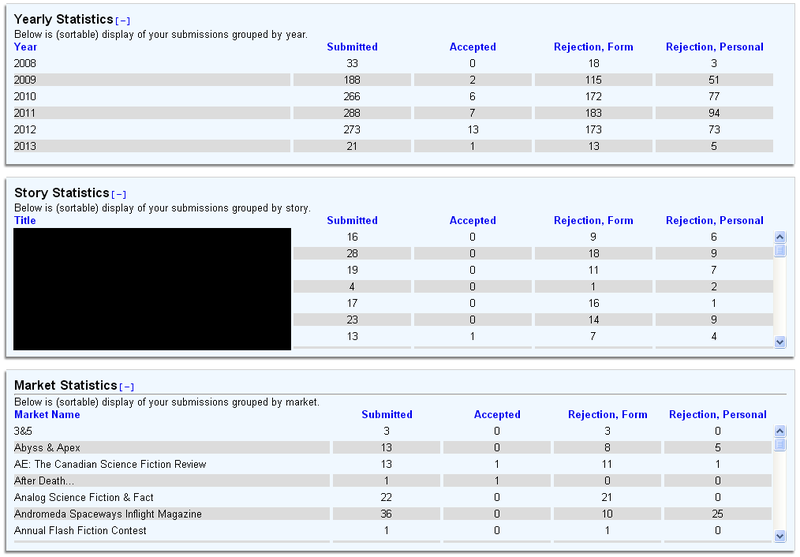 The data from every submission is combined to make anonymous statistics for all to view, so you can see the response times for different markets to decide where you want to submit or when to query an existing submission. For the initial release, we focused primarily on getting the core functionality working, and then on squashing bugs and improving the feature set. But we’ve gotten a lot of feedback that said that the Courier font used for the site was hard on the eyes. We want to make the site as friendly to you users as we can, so we listened to that feedback and changed the font of most of the site to make it more readable. We also added colored boxes and shadows to offset and emphasis certain areas of the screen and to add some variety. And we now have a logo. This has been a recent change, and we’d like to know what you think of the new look, so do give us comments. For each market, we provide numbers that show the minimum, average, median, and maximum response times. But we’ve also added a new feature that sets us apart–response time histograms. There’s only so much you can gather from looking at those four statistical numbers, but you can get a much better feel for a market’s response times by seeing a response time histogram, which are included with each of our market listings. For instance, here is a snapshot of the histogram from Orson Scott Card’s Intergalactic Medicine Show. You can see that there is a very strong peak of responses that take place at about 30 days. There are some that are shorter, even down to 1 day, and a smattering of longer ones. This is very representative of my experience with the magazine. They have a very steady slush response time at about 30 days, but stories that make it out of slush are much less predictable and longer, while the shorter response times can be the editor plucking stories from the slush directly or for writers that may have more history with the magazine and bypass the slush. With just a quick glance you can get a very good feel for these details by looking at this graph. So far all of our listings and data fields are fiction based. We will add poetry and non-fiction listings to help writers keep track of those too. We intend to put a system in place to allow staff members of publications to participate in the upkeep of their page, such as opening and closing dates, changes in rates, adding in seasonal themes/guidelines, etc. This will help the markets keep their pages as accurate as possible which will help encourage a volume of quality submissions, and will help ease the load on us as we try to keep listings up to date. Right now, openings and closings of markets are manually entered by us. But there are many cases where markets schedule their opening and closing dates far in advance, so there will be support added to automate this process. Writers may decide never to submit to particular markets, for editorial policy, personal feelings, or for whatever other reason. Each writer will be able to choose to ignore that market so that it will not come up in their searches anymore. On the homepage of The Grinder website, you can see the 40 most recent responses across the whole site. We intend to provide something similar that shows you such recent responses but only for the markets where you have pending submissions, so that you can tell at a glance where the response activity is happening. Right now the histograms are shown for every market. But in the future, if you are a logged in user with pending submissions at that market, those pending submissions will be marked on the histogram with a line, so that you can see where you lie in the spectrum of response times so far, giving you a quick visual queue about how unusual your current wait time is. If you like what we’re doing, give us suggestions on how we can be better, suggest new market listings, report bugs, upload your data and use the submission tracker. We’ve added a Donate button as well–we appreciate anything you can give, and we maintain our commitment to not require any payment to use the site. Thanks!